Keltec RMR30 configured as shown (Gemtech 22wmr suppressor, Magpul BUIS, Primary Arms 3x scope) fired at 30 yards yielded this group of 8 shots. The carbine was rested on my camera bag. Each grid square is 1/2″, the group is exactly than edge to edge. Minus the bullet diameter, we have a group under 0.3″ at 30 yards, so a little under 1MOA. 3x prismatic is not a target scope, but it’s fast enough in use for hunting and full daylight illumination is very useful. This entry was posted in ammunition, rifle, sound suppressor and tagged 22WMR, CCI, keltec, RMR30. Bookmark the permalink. Looks like a rifle I would very much enjoy looking over. Photogenic, fun, and an interesting concept. I once knew a police officer (department trainer) who told me the .22 WMR was a better defensive round than the .38 special, in his experience. From a high cap short carbine, I can see it as an excellent house gun. What do you expect the price to be like? I’d vastly prefer importing PPsh-41’s if sane gun laws prevailed. That is vastly superior firepower to this. I mean, why make new guns, if iconic old ones still abound in huge numbers? Scratch that.. PPsh is not that accurate. How accurate it is? As a defensive firearm, might make good sense for those who cannot handle heavy recoil. I can see it as a fun gun, but 22 Mag isn’t cheap. I got to play around a bit with an RMR-30 at SHOT, and I came away SERIOUSLY impressed with the little sucker. It’s LIGHT, I mean I think my CZ75 weighs more, it points well, it collapses down to nuthin’, and it looks like more fun than any one person should be allowed to have. It’d be the perfect defensive firearm for people who can’t handle the weight and recoil of a full-size pistol or shotgun. And in 5-7 years when these actually appear in stores, we all can find out how accurate there really are. This could be an awesome prairie dog/ varmint rifle. If the price is lower then the Magnum Research it would be a winner. (bullet in grains)*(calibre)*(velocity)/1000 for pistol and /100 for rifle. 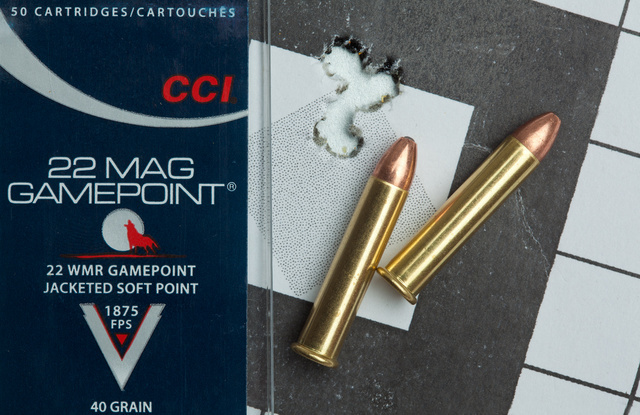 Out of a rifle; .22wmr scores a more than ample 168… for comparison 9mm silvertips in a pistol scores 53.5. So longer sight radius, larger magazine capacity, lower recoil, and twice the performance of 9mm by the numbers… sounds like a winner for home use to me. I am not trying to start a flame war. But would you please name the ammo and show your math. I googled some ballistic info and do not find any .22WMR scoring that high. 19.36 was the best I got. .22 x 1700 fps x 45 gr. / 100 = 168.3. Scored as a pistol, it’d rank 16.8, i.e. not suitable for defensive use if judged by the rough guideline of 40+ defensive power factor.